trash, remove 1 tag: Trash 1 program. Use this ability only during a run on this server. Kiss your programs goodbye, because the sysop from hell has arrived. Another tag-removal card from this set, much like Lily Lockwell, which adds another interesting tool into tag-centric decks. 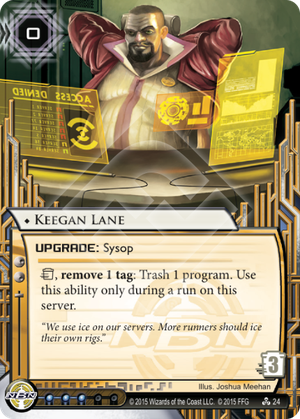 Keegan is a new level of trap that, once paired with a tag subroutine, especially strong or unavoidable ones such as Data Raven and Bandwidth, make runners think twice about continuing the run. Doesn't matter if they are running first click to shake the tags off later, the effect happens mid-run. Say goodbye to the only Corroder in your deck! Other benefits: zero to rez, three cost to trash, part of the "Future guy leans back" set along with Government Contracts and High-Risk Investment. The downsides: cannot take effect outside of a run on the installed server, so no same turn synergy with Midseason Replacements or SEA Source and loses power once the runner gets all of their breakers out, especially if they Femme a Raven. Also, three influence, so it's harder to get multiples in another faction if you have tags in Argus Security: Protection Guaranteed or some such. Absolutely worth an inclusion with a tag deck that wants to take the fight to the runner to slow them down. Make them put in recursion or rue the day they met Mr. Lane. We use ice on our servers. More runners should ice their own rigs. Be careful what you wish for, Keegan. If you're not, every Shaper (and some Criminals) might start packing Sacrificial Construct, and every Anarch deck will run the conspiracy breakers. And if that happens, you'll be completely useless and out of a job. Our buddy Keegan has always had a bit of a rough go of things. He's free program trashing, but only on the condition that the runner has taken a tag from some piece of ICE or has decided/been forced to float tags in some other way. If the runner is floating tags, you probably have a better way of winning the game than trashing a program. If you stashed Keegan behind a Data Raven, then you're relying on the runner choosing to take the tag, and you're hoping that whatever program you trash has enough of an impact to swing the game heavily in your favor. Thoth admittedly makes this a little more likely by forcing the tag, but then you had to pay 7 to rez Thoth. All of this is assuming the runner hasn't "iced their rig" with SacCon or made it resilient to program trashing by running the conspiracy breakers/Clone Chip. As if that wasn't enough trouble, Keegan also has to throw the runner a bone and remove a tag, saving them a click and two credits (or three, if you're SYNC). In a meta where everyone runs Criminal decks with single copies of each icebreaker and doesn't play SacCon, Keegan is probably an above average card. In most metas, he's extremely situational and, as odd as it is to say for a program-trashing effect, probably a little underpowered. If you want to trash programs, you should probably stick with the vastly more flexible Marcus Batty.